The Netherlands is the country typically associated with windmills. Most other European countries also have many historical windmills. Up until 2007, Germany produced the most wind power of any country in the world. Denmark has the highest percentage of its power provided by the wind. 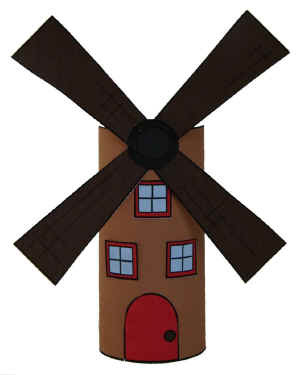 Note: You could use a paper cup (upside down) instead of a toilet paper roll as the base of your windmill. Simply paint it rather than wrapping the rectangular piece of paper around it. Note: You can attach the blades (sails) of the windmill using a brass tack so they actually spin. Glue the door onto the front of your windmill. Glue the windows around the windmill as you see fit (you can use all three or less if you want). Glue the sails (blades) of the windmill onto the top. Glue the large circle and then the small circle into the center of the blades..